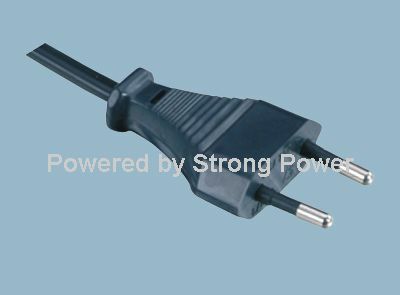 The power cord includes a first end portion provided with a plug adapted to be inserted into an electrical outlet. The first end portion extends to a second end portion that is electrically coupled to a plurality of electrical components in the appliance. The test/reset unit is spaced from the GFCI device along the power cord. 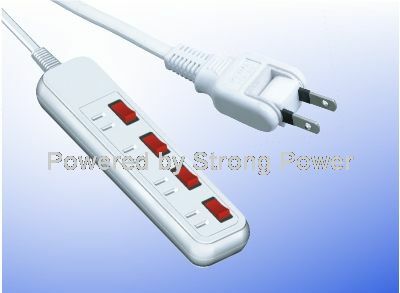 Preferably, the test/rest unit is connected to the power cord through an extension lead. Certainly, virtually all receptacles are provided with some form of over current protection, typically a fuse or circuit breaker. In general, the fuse or circuitbreaker functions to interrupt power to a receptacle or other electrical device in the event current flowing through the circuit exceeds a predetermined threshold value. The National Electrical Code (NEC) sets the standard for matching a particularcircuit breaker with a particular size or gauge wire. In any case, by cutting off power to an electrical appliance having a shorted circuit, wires carrying the electrical current to the appliance are prevented from over-heating and possibly melting. The GFCI device could either be mounted at a circuit panel, i.e., incorporated into a circuit breaker, or provided directly at thereceptacle. GFCI devices interrupt power to an electrical load in the event that a ground leak is detected. In simple terms, the GFCI device cuts off power to an electrical load having grounded portions of the load exposed to electrical current. Byinterrupting power to a device leaking current to ground, an individual who may come in contact with a grounded portion of the load will not receive a shock. Circuit breakers are typically located inpanels that, if not readily accessibly by service personnel, can be accessed by other on-site personnel. In contrast, GFCI devices that are located at the receptacle or in the power cord may be made generally inaccessible by the particular positioningof the vending machine. That is, a vending machine(s) or another electrical appliance(s) may block access to the receptacle or power cord plug, while the appliance may be quite difficult to move. Accordingly, despite the existence of various GFCI devices available in the prior art, there still exists a need for a GFCI device that can be employed with electrical appliances having receptacles or power cord plug portions that areinaccessible. More specifically, there exists a need for a GFCI device having a remote test/reset unit that can be employed in applications where access to a receptacle or power cord is, at least, substantially limited. The electrical appliance includes a cabinet that houses a plurality ofelectrical components employed in the overall operation of the appliance. The appliance is provided with a power cord that electrically connects the electrical components in the cabinet to a source of electricity. The plug is adapted to be inserted into an electrical outlet. The first end portion extends to a second end portion which iselectrically coupled to the plurality of electrical components in the cabinet. The first and second end portions are interconnected through an intermediate portion. Preferably, both the GFCI device and the test/reset unit are electrically coupled tothe power cord, with the test/reset unit being separate from, yet electrically connected to, the GFCI device. Most preferably, the test/reset unit is spaced from the GFCI device along the power cord. In accordance with the embodiment shown, dispensing zone 16 is arranged below storage/display zone 14 and includes a dispensing chamber 37 having a plurality of product access openings 39 and 40 that enable the consumer to remove a dispensedproduct from dispensing chamber 37. Product access openings 39 and 40 are provided with delivery doors 43 and 44 respectively, each of which is pivotally mounted to dispensing chamber 37 so as to be shiftable between a first position, effectivelyclosing off a respective product access opening 39, 40 and a second position enabling the retrieval of a dispensed product from dispensing chamber 37. Test/reset unit 130 enables service personnel to test the operational capability of GFCI device 120 and reset powerto vending machine 2 following a test or in the event that GFCI device 120 has sensed a fault condition and interrupted power to vending machine 2. Test/reset unit 130 includes a main body portion 132 upon which is mounted a test button 133 and a resetbutton 134. Of course, it should be understood that additional features, such as indicator lights, could also be provided on main body portion 132. In accordance with the most preferred form of the invention, test/reset unit 130 is arranged remote from main cord body 101 of power cord 100 through an extension lead 144. Extension lead 144 extends from main cord body 101 and includes a firstend 146 that leads into main body portion 132 and a second end 148 that ultimately connects to GFCI device 120. In the embodiment shown, extension lead 144 extends to intermediate portion 116 of power cord 100. It should be readily understood that various changes and/or modifications can be made to the invention without departing from the spirit thereof. For instance, whilethe test/reset unit is shown attached to the power cord through an extension lead, it should be understood that the test/reset unit could be provided along the axis of the power cord itself or at the female plug portion that connects to the appliance. In addition, while the electric appliance of the present invention is described as a vending machine,the invention is only intended to be limited by the scope of thefollowing claims.